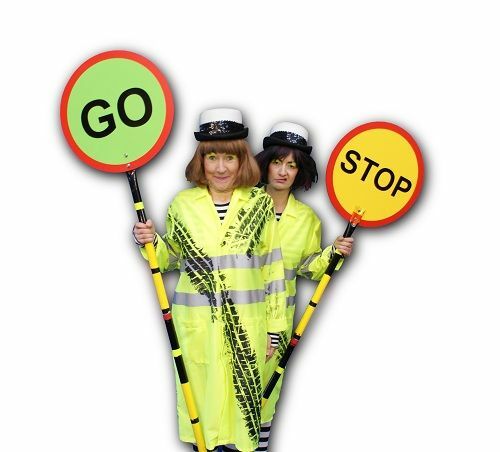 With excessive enthusiasm and a slippery grip on reality, The Lollipop Ladies are here to help and hinder! Fluorescent and effervescent, the 64th emergency service, the luminous hand of the law, they are a veritable flurry of fluoro. 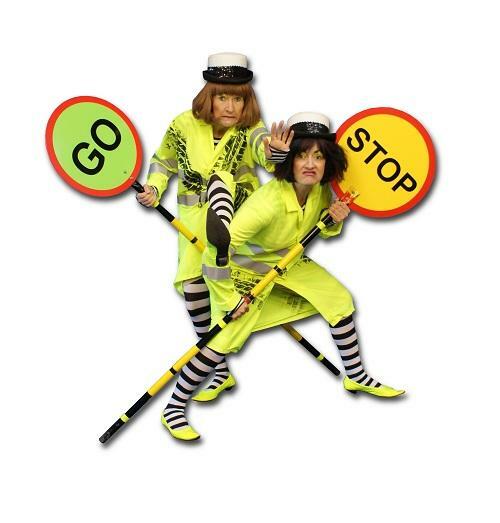 Experience their traffic-trauma, delight in their neon neurosis, and cross them at your peril! 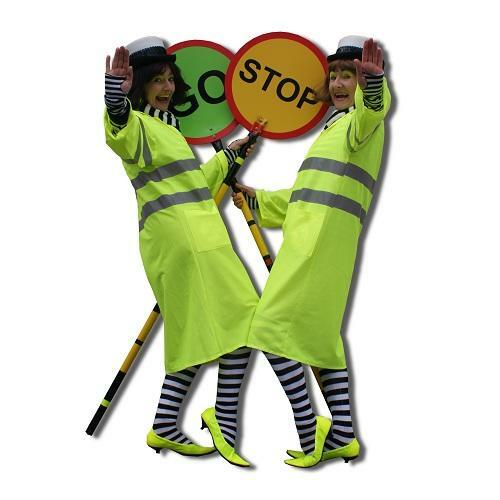 These larger than life lollipop ladies are available to amuse & delight your audience with their antics and interactions in this comic character walkabout show consisting of one or two performers. They make a wonderful ‘meet & greet’ act, and an excellent means of ‘transporting’ your guests between venues whilst providing many a chuckle and guffaw en route! The standard length of performance is 3 x 30 or 2 x 45 minute sets. Curious Cargo entice you into their extraordinary world with grace, humour and a touch of anarchy. The Lollipop Patrol created just the right amount of consternation and mayhem to gather a loyal following in just a few hours. Accessible and high quality, their shows were hugely popular with people of all ages and the company were a joy to work with – positive, professional and fun. 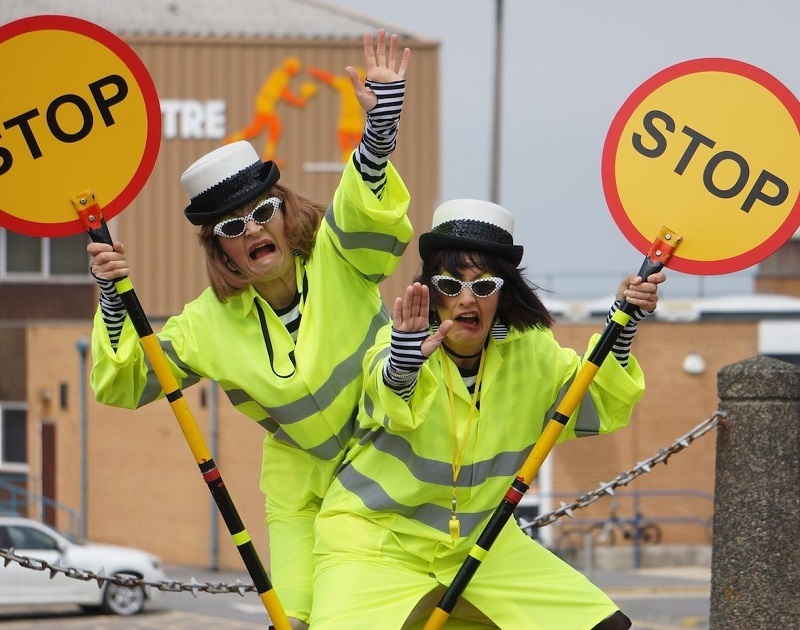 The Lollipop Ladies were an asset to the Art Car Parade, and the audience loved their mischievous redirecting of traffic and people, and their banter delighted passers-by. The work of the company is always of the highest quality, and they are reliable and easy to deal with from a production point of view, as well as being creative and playful when performing. The Lollipop Ladies went down an absolute treat at the Feel Good Festival. It was a delight to see you encourage such a wide variety of people to play and laugh – this is exactly what we wanted to achieve! Your antics really brightened up the day and gave unsuspecting passers-by full permission to be silly. And watch out for those officious lollipop ladies who seem intent on helping people get to places they just don’t want to go.